Mindfulness practice is simple but not easy. We endeavor to bring full presence to whatever we do, to open ourselves fully to what is alive in us and around us, and to be aware of the inextricable connectedness of life. In the Still Water community we join together at weekly sittings and gatherings; at retreats, classes, and workshops; and informally, as friends. We come to know and respect each other, to live and grow, being supported by and supporting others. 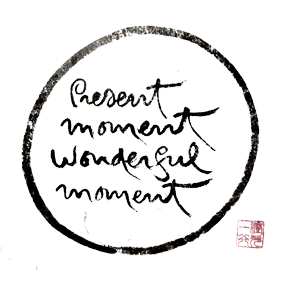 We are a practice community in the tradition of Thich Nhat Hanh, a Buddhist monk, author, and activist who has introduced the Vietnamese Zen practice of Engaged Buddhism to the West. While we draw inspiration from Thich Nhat Hanh’s life and teachings, we are not limited by the Buddhist tradition; we seek out and learn from other traditions and ways of practice. As a community, our core purpose is to nourish the seeds of mindfulness, compassion, and community in individuals, families, and the larger society. Our Senior Teacher is Mitchell Ratner, who has been a lay member of the Tiep Hien Buddhist order since 1993 and in 2001 received the Dharmacariya (Meditation Teacher) transmission from Thich Nhat Hanh. Most of our events begin with a time for settling and contemplation. The basic practice is to find a comfortable upright position, focus our attention on our breath, and calm our chattering minds. We may begin by saying to ourselves, “Breathing in, I am aware of breathing in; breathing out, I am aware of breathing out.” Some people find it helpful to count their breaths: “Breathing in, one; Breathing out, one. Breathing in, two; Breathing out, two. . . .” We can count to five and then count backwards back to one. As our minds become more stable, we can let go of the words and the numbers and just be with the breath, giving it our full attention, noticing the changing sensations as we breathe in and as we breathe out. When our attention drifts away from our breathing, we simply note that we have drifted and without judgment or self-criticism return our attention to our breathing. Awareness of the breath, often called conscious breathing, is the beginning practice and the foundation for further practices. Over time, as our thinking mind calms, we learn to open our present moment awareness to all of our body; to our feelings; to our attitudes, emotions, and acts of will; to our thoughts and ideas; and also to the people and the world around us. We also practice formal walking meditation. It is much like sitting meditation, except that we coordinate our steps with our breathing: as we breathe in, we take a step; as we breathe out, we take a step. We are mindful of our breathing and of our stepping. Our bodies are upright and relaxed, our eyes softly focused just ahead of us. When our mind drifts away to the past or to the future, we gently guide it back to the present moment. Many of our events include time for dharma discussion, or sharing of the teachings. Dharma discussion creates a supportive environment in which we can mindfully share our practices and insights as well as our deep questions and struggles. We share from our hearts. We say what is true for us, what really matters. It may be helpful to imagine the words literally emerging from our hearts, from our center of being. Unless it is specifically requested, we do not advise, fix, or correct others. We listen from our hearts. We give each other the gift of our full presence and of our compassion. We are attentive not just to the words, but to all of what is being shared. We listen to understand, affirm, and appreciate. We are of lean expression. We say what is essential and try not to ramble, recognizing that others may wish to share. We stay present. Sometimes we call this practicing spontaneity. If we are preparing what we have to say, we are not listening to others, and our sharing may abruptly change the energy of the conversation. We learn to trust that what needs to be said will be said. Dana is a gift given from the heart. It brings joy and benefit to both the giver and the receiver. The weekly sitting groups and many other Still Water MPC activities are freely offered to anyone who would like to participate. However, the continued existence of the community depends on the Dana (generosity) of those who attend. Dana pays for room charges and other community expenses; allows us to make contributions to Plum Village and other institutions that spiritually support us; and allows the community to support our Senior Teacher, whose work is to offer the teachings and organize the community. How much is enough? Every gift is appreciated and every practitioner treasured. If you need some further guidance, please consider giving $5 or more at a morning sitting group, $10 or more at one of the longer afternoon or evening groups, or making a monthly pledge of $40 or more. Because the Still Water MPC is a federally recognized religious organization, donations are tax deductible. More information about our community, our special programs and weekly activities, and our practice is available on our website: www.StillWaterMPC.org. The community maintains an email announcement list through which we share teachings relating to our Thursday evening programs at Crossings in Silver Spring and alert participants to upcoming mindfulness practice events. You may subscribe by filling out an enrollment form on Thursday evening or by signing up on this website. There is also a special email announcement list for those who attend the Sunday evening Columbia program. You may subscribe by emailing TFMcCormack@Yahoo.com. Thank you for joining with us. If you have further questions about our community or our practice, please feel free to contact us by email at info@StillWaterMPC.org or by telephone at 301 270-8353. When coming to Still Water events, so as not to distract others, please dress simply and refrain from wearing perfumes or oils that might disturb those with sensitivities. Before entering the meditation hall, you are invited to pause. Notice what you are bringing with you, literally and figuratively, and what you would like to leave outside in the hallway. (Also, please double check to make sure your cell phone is turned off.) When you are centered, enter in freedom. If you enter the meditation space when people are setting up, your calm assistance would be appreciated. If assistance is not needed, please select a place to sit and silently prepare yourself for meditation. If the meditation is underway, please walk to an available place with quiet mindfulness, as if walking not to wake a sleeping child. Similarly, please settle yourself onto your cushion or chair with as little noise as possible. Each encounter with a fellow Sangha member is a moment of potential connection and support. When you pass something to the person next to you, please follow the Plum Village tradition of making eye contact with the recipient, offering the item with both hands, and bowing to the recipient. Similarly, if you are receiving an item, make eye contact, offer a slight bow, and receive the item with both hands. The suggestions above are just a few of the Mindful Manners taught to lay practitioners and novice monks and nuns in the Plum Village tradition. We hope that the practice of Mindful Manners will bring you solidity and joy and nourish everyone in the Still Water community.